Well our January Clean Out the Cupboards Challenge is coming to a close today, and I’m proud to say that we only spent $90.89 of our $375 monthly grocery budget this month to feed our family of seven, two cats and a dog! I’m amazed that we got by with spending so little, and that we actually still have enough food in the freezer that we’ve planned out the next two weeks’ worth of menus as well. That buys me a couple more weeks before I have to plan any more freezer cooking days, and it’s going to have a big impact on February’s budget too! I really thought I was doing pretty good on the budget before, but I’m proud to have developed some great new habits that will hopefully continue. For example, at the beginning of the month it was almost painful to pass up on things like 5 cent pasta and 45 cent fruit sorbet, but I refused to buy anything we already had on hand and now my final numbers for the month are a huge motivator to keep doing that. Thanks so much to everyone who participated, and who shared their posts with us! If you’ve made it through the month and have a final post, please link it up below so we can give you some pats on the back and virtual hugs! This month has really flown by so far and I’m proud that we have literally cleaned out the stockpile and freezers while doing the inventory for the Clean Out the Cupboards Challenge, but I’m really still amazed at how much is left! This will be the last full week of the challenge and we were still able to plan a good variety of meals for the week (I was afraid it would be all pasta by the end of the month!). I have to admit that I’m going to get to cheat a little this week since I’m heading out of town tomorrow for the Blissdom conference, but hubby will still be feeding the kids from the stockpile. I’ll be doing a wrap-up post next monday for the Clean Out the Cupboards Challenge but we’re doing so well with it that I’m already planning to continue on into next month! I think shopping from our stockpile has gotten us into some good new habits. 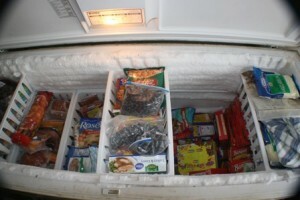 This is a picture of the freezer from this morning, we’re getting close to the bottom, but there is still a ways to go! I’m looking forward to defrosting one day real soon 😉 Please link up your posts below so we can see how you’re doing this month! Clean Out the Cupboards Challenge: Doing Great! This is the third week of the Clean Out the Cupboards Challenge and so far we’re doing great! Yesterday I sat down with the inventory lists from the pantry and the freezer to do the menu plan for this week and I got so into it that I actually planned ahead all the way through February 12th. It’s crazy that we have enough stuff on hand that we could actually get away with buying only milk, bread, tortilla shells and a couple tomatoes for the next four weeks! Of course I haven’t given up shopping altogether, but I’m doing pretty good at keeping the trips to a minimum. I can’t wait to see how we do on the budget for the month, and I’m super excited about continuing on with the challenge into February! I’m still excited to be participating in the Clean Out the Cupboards Challenge during the month of January – of course it’s pretty early! I’m still shopping for the best bargains that I feel obligated to post about can’t pass up, and staples like bread and milk, but for the most part I’m just shopping from my own stockpile with the goal of spending as little as possible this month. The toughest part so far has been doing the inventory because we have SO much stuff in the freezer – we have a chest style freezer in addition to the side-by-side refrigerator one and they’d gotten overstuffed. First thing we did was double bag two large yard trash bags and start throwing out things that had been waiting around too long, then make a list of the rest. It wasn’t too difficult to take an inventory of the stockpile because we’re lucky enough to have a large space above my husband’s bee house to spread it out. On the other hand, the kids LOVE to “help” organize in there so it’s a little on the messy side, but we do have everything divided by category and type so it’s not hard to find anything. I took a bunch of “before” pictures and plan to take some more after the challenge is over. Now that I have a good inventory it’s very easy to plan the weekly meals, but with more than a dozen boxes of pasta in the stockpile I’m trying to plan ahead a little so that we don’t spend the last week of the month eating spaghetti or rice. My favorite way to figure out what to make when I’m staring blankly at a list of ingredients is to head over to Recipe.com and type a couple of ingredients in the search box and see what comes up. For example, I typed in “penne” and “chicken” and 73 recipes came up, then I clicked on the ‘5 Ingredients or Less’ category to narrow it down to six. I’m excited that we’ve officially kicked off the Clean Out the Cupboards Challenge series that is being co-hosted by myself, Laura at Frugal Follies, Robbie at Going Green Mama, Crystal at Mrs. Happy Homemaker, and Rebecca Jean at Midnight Maniac, and I’m hoping that you guys are participating as well! This January we are challenging ourselves to eat from our pantries – to use up all that excess food sitting in the backs of the cupboards, from the refrigerator door, from the stockpile and from the freezer – and limit our shopping to as little as possible. Last week I did an inventory of our stockpile and freezer and I’ve already posted this week’s menu based on what we’ve got available on hand. and BEST OF ALL – I’m looking forward to starting out the year way below budget! Please let us know if you’re cleaning out your cupboards this month – submit your link below or leave a comment and tell us about it! I’m super excited to announce the new Clean Out the Cupboards Challenge series that I’ll be participating in and posting about throughout the month of January! The Challenge is being co-hosted by myself, Laura at Frugal Follies, Robbie at Going Green Mama, Crystal at Mrs. Happy Homemaker, and Rebecca Jean at Midnight Maniac, and I’m hoping that you guys will participate as well! and BEST OF ALL – start out the year way below budget! So here’s the deal – this January we plan to challenge ourselves to eat from our pantries – to use up all that excess food sitting in the backs of the cupboards, from the refrigerator door, from the stockpile and from the freezer – and limit our shopping to as little as possible. Eat! This is not an eat as little as possible challenge. Prepare healthy foods for your family, even if it means doing more shopping than you expected. Don’t load up this week with a month’s worth of groceries. Go ahead and do your regular shopping. Don’t forgo buying groceries then eat at restaurants all month long. Of course, feel free to eat out as you normally would. As for the details of the challenge, it’s up to you! You might want to allow yourself to purchase great deals; others won’t. You might want to use CVS’s Extra Care Bucks or Walgreens’s Register Rewards to buy free items, or not. Next week, we’ll kick off the challenge by posting our goals. So figure out what your goals are – is it to save money? to have more room in your pantry? to stop wasting food and thus help the environment? Figure out why you want to participate in the challenge – I look forward to hearing what your goals are! I’ll be spending tomorrow doing an inventory of my pantry, stockpile and freezers so that I’ll have an accurate idea of what all I’ve got on hand before we officially get started in January.